Cindis World: Dead Deal - Bed Bath & Beyond Clearance deals with free shipping! Dead Deal - Bed Bath & Beyond Clearance deals with free shipping! 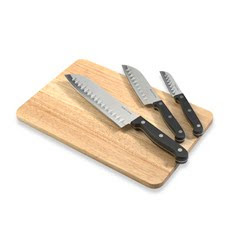 Bed Bath and Beyond has these 3 Santoku knives and cutting board clearanced for $9.99 with free standard shipping! Awesome deal! Go Here and snag yours now! !